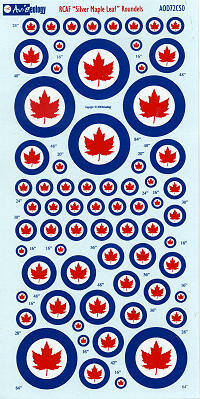 There are many times when one just needs a decent roundel decal and if your penchant is for the RCAF, then this is a sheet for you. Like the markings for most air forces, the national insignia is rarely static. Sometimes there are small changes, sometimes there is a major upgrade. This sheet covers the Canadian Maple Leaf marking that was in use from 1948 when the Maple Leaf was first used until 1965 when the current New Leaf version was decreed. Of course, this change didn't happen overnight so there were some hybrids until things stabilized around 1967. This is the 1/72 sheet and provides a number of different sizes from 16 inch all the way up to 84 inch roundels. The majority of the information on these roundels comes from my friend Patrick Martin's superb book "RCAF Aircraft Finish and Markings 1947-68". Pat and I are slide traders from way back and we've met up at various photo shoots during the 80s and 90s. Pat's research is top notch and what he has found regarding roundel use is provided in a chart that is included in the instructions of this sheet. Of course, one can find variances from the norm, so it is always best to have a photo of the subject being modeled. The sheet itself is superbly printed to a high quality and is quite crisply done. If you are in need of an RCAF roundel sheet or just what to have it available for future projects, then this is a very good one. My thanks to www.aviaeology.com for the review sheet. You can get yours direct.